Who decided the best way to approach this ad campaign was to attack their target market? In the ad, they highlight sexist and bullying white males. Needless to say, the ad is not doing so well. There are over 300,00 down votes on YouTube and the number is growing by the second. Better yet, the comment section is jam packed with men who are vowing to never purchase Gillette products again. 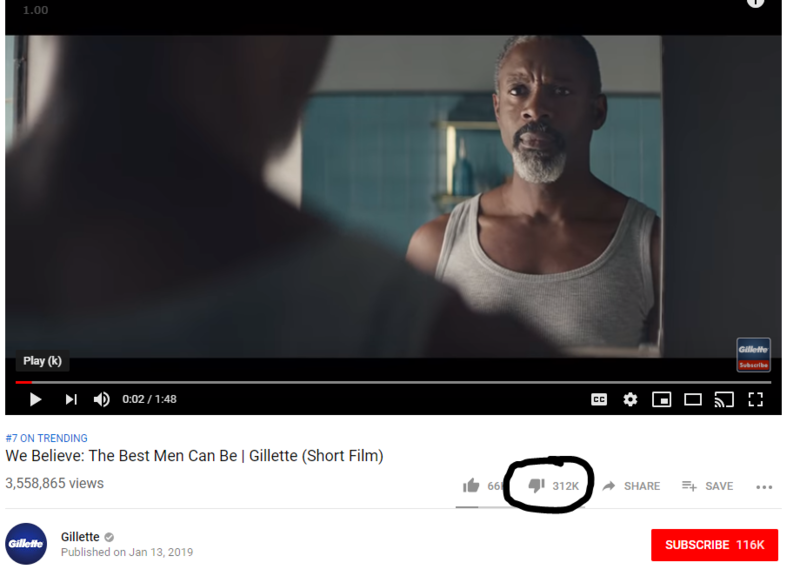 Gillette knows it’s a disaster and has began to delete comments that are criticizing their ad. The people who made that Gillette ad seem to think that the average man, unless instructed otherwise, will stand back and watch two children beat each other senseless without intervening. Have the folks at Gillette ever actually met a man before? Normally I’m not on board with boycotts as I think the market sorts itself out eventually, but would totally be on board with this one. Harry’s Razors, hopefully you haven’t done something equally awful. Or worse yet, hopefully you don’t stand with Gillette.